"Derby College made me want to carry on farming and made it possible for me get my 'tickets'"
Agricultural contractor Tom Longdon says Derby College convinced him to stay in farming – and made it possible for him to afford essential qualifications. The 20-year-old took Agriculture at Level 2 and 3 at Broomfield Hall, while also passing five separate industry competency qualifications. From a farming background, Tom turned to Derby College after a job he had lined up as an apprentice mechanic fell through just days before he was due to start. His time at college gave him an insight into the “big world of work” including a valuable business module at Level 3. The training helped Tom, 20, launch his agricultural contracting business in 2015, while still at college, and he “kicked it off properly” last year. 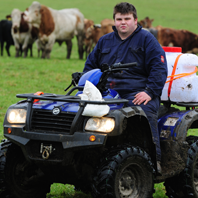 His dad has health problems and Tom also works on the 450 acre family beef farm at Trowell, Nottinghamshire. He said: “Derby College made me want to carry on farming and made it possible for me get my “tickets” (NPTC competence qualifications). “For instance, I’d looked into training for the telehandler (boom lift) and it would have cost £1,000. “I wouldn’t have been able to do it. But through the college, it cost £120 in total to sit the test. For most of your “tickets”, you get training as part of the course but you have to pay for be the test. It’s a substantial saving.